When protesters went out to sea and climbed the tall ships near the construction site, they struggled as the crewmen attempted to push them off. 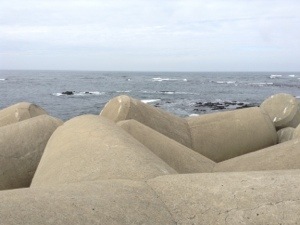 During a religious ceremony in April 2012, a coast guard officer chased an activist on the large tetrapods (see picture below) by the water. As another officer came and both were being aggressive, activists and Father Moon came on the tetrapods and urged them to be careful. One officer struggled with Father Moon, an elderly man, leading him to fall 5 meters through several large concrete tetrapods. He was lucky to survive and after many months of recovery, he still occupies the gate of the construction site every day, leading the daily Catholic Mass. Though none of the injured or harassed protesters saw justice, they still continue to struggle on and block the gates multiple times each day. Though an estimated 500 activists have been arrested since protests against naval base construction began in the village 6 years ago, dozens still live in Gangjeong Village to demand peace and justice. Below, is a profile of just some of the activists that join the daily movement for peace on Jeju Island. 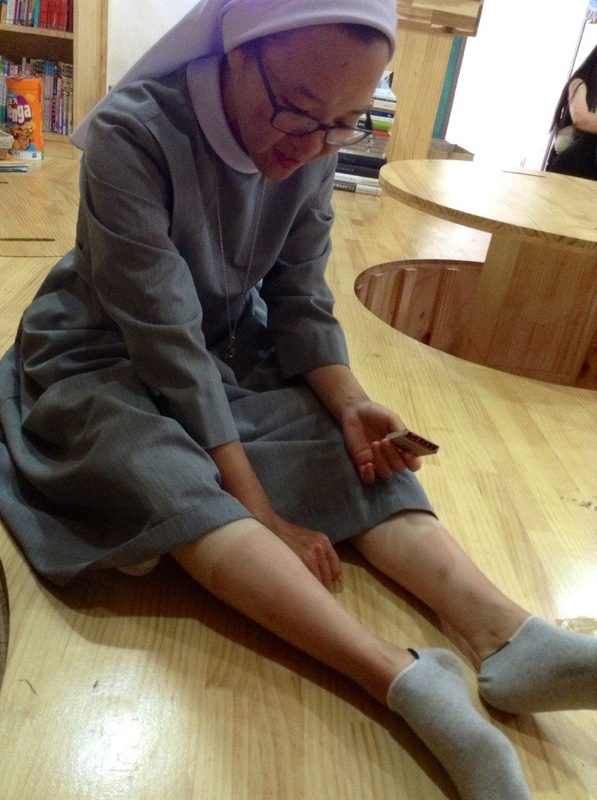 Meet Sister Yang-up, a nun who has joined the struggle, and is now well-known by the police as they must forcibly remove her from blocking the gates every day. Every morning, after the sun rises, Yang-up, along with dedicated activists and fellow nuns from her convent, meet at the gate and sit in meditation to perform 백배, or 100 bows. The gate opens each morning at 7AM and as the view of concrete and construction cranes on the water are exposed, the nuns and activists begin to offer 100 bows for peace. Everyday, police in undercover cars watch and videotape the “illegal” action. Yesterday, several police officers came on the 95th bow asking us to not block the gate and disrupt the work of the construction site. We continued for the final bows disregarding the police officers’ request. Yang-up and I spoke after and joked that the police must be very thankful for the activists keeping them busy each day. Because the alternate gate was openly accessible and we were in our last minute of bowing, the police’s interference was unnecessary to say the least. At 10 am each day, Yang-up joins the daily Catholic Mass and along with other nuns and priests, she blocks the gate during the ceremony. Just yesterday, Yang-up was removed from blocking the gate 15 times before the mass. As the police moved her away from the entrance and the construction trucks would come in and out, she would move right back to block the gate as the police drove away – 15 times. The members of the Catholic Church block the entrances each day in the place of activists because the police will not arrest nuns and priests. It makes one wonder what would happen if all the activists dressed as nuns and priests. Yang-up says that she hopes to be arrested before she goes back home to Seoul in August. Perhaps if a member of the Church is arrested, the movement will become more powerful. In the Peace Library and Cafe of Gangjeong Village, Sister Yang-up shows me the tan from hours of kayaking out with the Save Our Seas (SOS) team. Great to see this new blog. I don’t see the ‘about’ button to see more info though.